Syrian refugee Sameera Al Salam shows a colleague how to strengthen a paper handbag with glue, at an up-cycling workshop in Irbid city, northern Jordan, May 9, 2018. 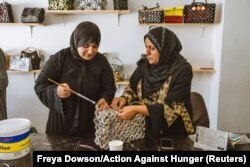 Sameera Al Salam folds a discarded piece of newspaper into a long strip then loops it round her finger to form a tight circle, the first stage of making the upcycled handbags, trays and bowls the Syrian refugee hopes will help her earn a living. Al Salam, 55, was a hairdresser with a passion for "art and making things" before she fled her war-torn homeland for Irbid in northern Jordan with her family in 2012. "We were living a really happy life. I had a garden where I grew everything," Al Salam told the Thomson Reuters Foundation. "We had to leave because of the airstrikes. We were always trying to put things in front of the door to protect the children. Whenever I remember, it breaks my heart." Like most of the more than 655,000 Syrian refugees living in Jordan -- and many Jordanians -- poverty, debt and unemployment dominate the family's existence. Al Salam hopes her involvement in a new rubbish collection and recycling plan that aims to alleviate the poverty of both refugees and locals and bring the two communities closer will help turn things around. 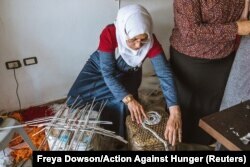 The project, managed by charity Action Against Hunger, employs 1,200 people to collect and sort waste from the streets and provides temporary work permits to refugees who take part. Jordanian mother of seven, Dallal Sarhan, plaits and weaves newspapers to construct a side table, at an up-cycling workshop in Irbid city, northern Jordan, May 9, 2018. Awsaf Qaddah, a 39-year-old Syrian widow, said working as a rubbish collector initially felt like "a kind of shame," but she now feels only pride. "The job took me out of this atmosphere I was living in at home. Women can and should go out and work, especially with the circumstances we're facing," she said. "I have no husband or father or brother to help -- I'm proud to do it." "Women and men would make comments about me picking up waste," she said. "I said to one man, 'I'd rather work than come to you for the money' and he apologized." "First there was a focus on breaking the culture of shame for women. Then we wanted ideas of how they could benefit from waste," said Sajeda Saqallah, programme manager with Action Against Hunger. "Upcycling is a new concept here, so we took them to Amman to learn about it." Al Salam said her husband did not object to her taking part in the project. She now hopes she will get training on marketing and trademarking and win one of a number of new contracts Action Against Hunger is providing to carry on upcycling for wages. Syrian refugee Sahira Zoubi works on a new handbag, made from recycled newspapers, at an up-cycling workshop in Irbid city, northern Jordan, May 9, 2018. Zoubi, who has not seen her husband since the Syrian army captured him in 2012, has made close friends through the project from both Syria and Jordan who she says are "like siblings." "Doing this project is so joyful because you come here and forget about your problems," she said. "I never really mixed with people before this. I was afraid to go outside, I wasn't involved in the community," she said. "I was from a different country. I didn't know what people were going to do to me or what they would say. Now I like to mingle."